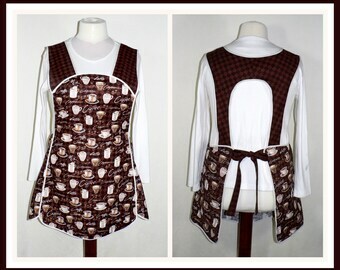 The retro 50s Smock Apron is based loosely on a vintage 1950s apron pattern that was in my great grandmothers collection-- altered to fit modern size ranges. 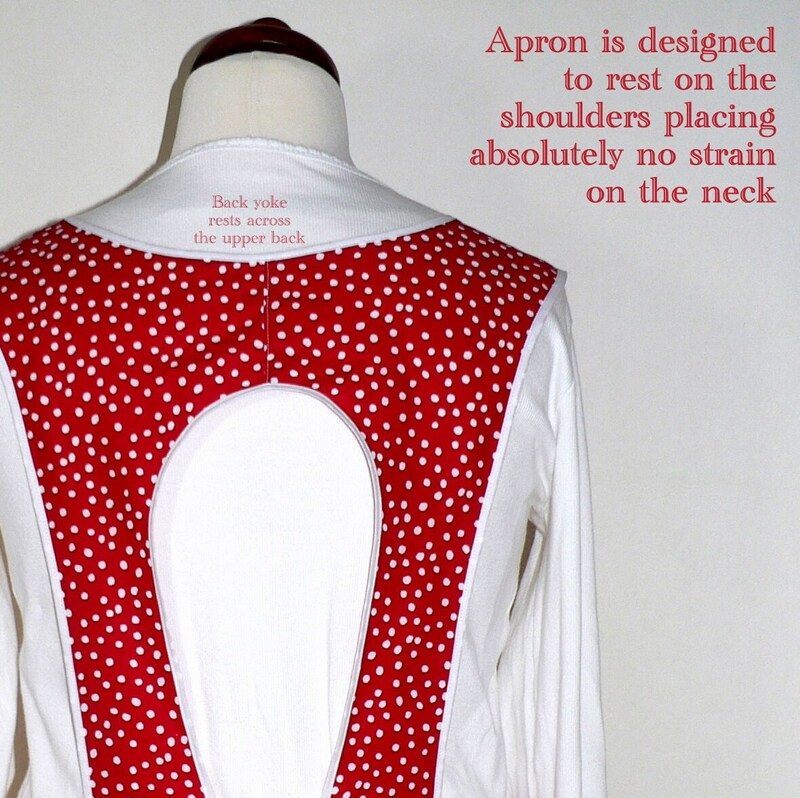 This charming red polka dot apron is so easy to wear! Made to gently slip over your head and then tie at the waist. 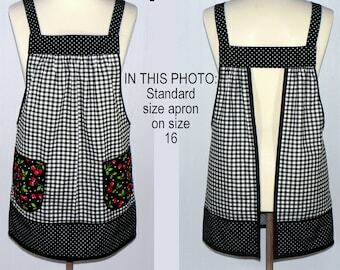 Wide straps go over shoulders and attach to apron in back at the waistline. (Shoulder straps are shaped and joined together across upper part of back, which is why it is sometimes called an "H back" style of apron.) Apron rests totally on the shoulders, placing no strain on the neck. Curved lower edges of front panel and sides add interesting scallop detail. Flattering shaping is accented by white bias trim on every seam line. Very comfortable style to wear. 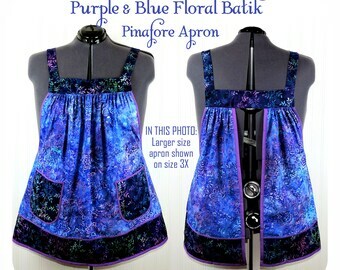 (Apron shown above is the "22W - 24W size" shown on my size 2X dress form.) Makes a great gift for the cooking/baking enthusiast on your gift list-- or for a very special treat for yourself! I am super excited about my new apron. Laurie was very helpful and communicated with me very well. The apron was exactly what I was looking for. I had trouble finding an apron because of my large bust area. This fits perfect!! I love this apron and the green fabric used. Sewn with great skill! I added a modification too and am so happy with the longer length. There was a slight hiccup but all things were resolved in a timely and highly professional manner. Thanks so much! I desperately need and love H back aprons as they don't hang on my neck. I ordered two of these lovely aprons and they are just as described. Beautifully made and fit well. Communications about timing and shipping were perfect.